Now it is easier than ever to integrate AquiferSM cases into your curriculum! Our searchable Case Library feature provides a powerful tool for planning and tailoring courses to your needs. With easy search and filter options and detailed case information available at-a-glance, you’ll be able to quickly search across all of your available Aquifer courses. Find cases by system, diagnosis, patient demographics, and access downloadable case summaries in AqueductSM. It will change the way you use Aquifer cases. Are you taking full advantage of the cases available with your Aquifer subscription? Support your curriculum with a full library of high-quality content—available at no extra cost. With access to cases from your program’s subscribed courses and Aquifer’s five free cross-disciplinary courses, the new Case Library page is the place to browse cases, plan your course assignments, and create custom courses. With simple search and filter options, administrative users can quickly find the content they want to cover and select cases to create custom courses. Filter cases by diagnosis, patient demographics, system, and more, to find the content your students need to complete their clinical experiences. Add your selected cases to a custom course with just a few clicks, or chose cases to assign directly to students to prepare or review key clinical concepts. Our case list now displays key case information at-a-glance. With one click, you can view case synopses, learning objectives, and printable Case Summaries with a full overview and key knowledge gained from each case. Combined with the case search, it’s simple to decide which cases to assign your students or include in your next rotation from your Case Library. As you know, Aquifer cases are authored and continuously updated by the expert healthcare educators who make up the Aquifer Consortium. Case authors and the date the case was last updated are now displayed for each case—so you can be sure your students are being provided up-to-date content written by your trusted peers. Selecting favorite courses now allows you to filter your courses page and view only the courses you need. Clean up your courses page by setting favorites and filtering to display only the courses you want to see. Save time creating custom courses with our new Duplicate Course feature. You can copy all the cases and/or users from an existing course into a new custom course in just a few quick steps. Any course—including existing custom courses and Aquifer signature courses—may be duplicated. Once you’ve created the new custom course you can give it a new name and description, and edit it further by adding or removing cases and users at any time. Worried about finding your way around the new features? Our new interactive, step-by-step guidance makes it easy to get up to speed with support that walks you through workflows, allowing you to complete your tasks while you learn. Click on the “Need Help?” widget at the bottom of your window to access support right where and when you need it—24 hours a day, 7 days a week. 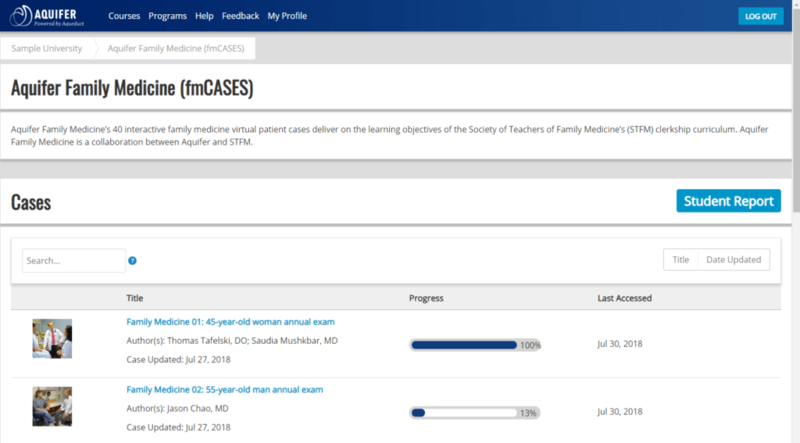 Students now see a progress bar for each case on their course pages, showing their progress through the course in a simple, easy-to-use fashion. They will also see the date that they last worked in each case, plus case authors and the date that each case was last updated on the case list display. Students can select favorite courses too, making it easier to find what they need, or update their courses page as they change rotations.